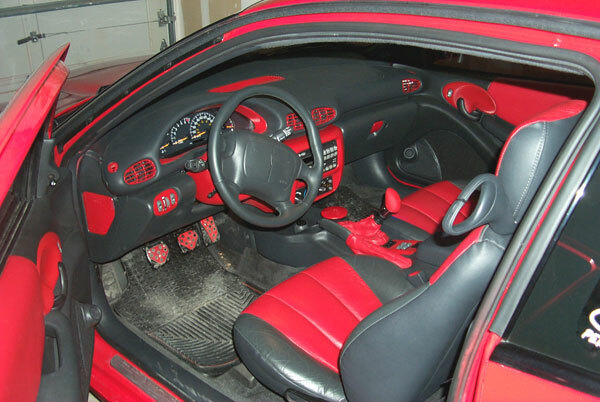 How to paint your plastic car interior parts. This is the procedure I used to paint the plastic interior parts in my interior. Note: These instructions are for painting plastic parts only and do not apply to vinyl pieces like the upper dash. For those you'll need special paints and I have no experience with them. I bought all my painting supplies from Canadian Tire and used their store brands. Any good automotive supply store should sell colour matched spray paints. You'll need plain gray primer, spray paint in your colour of choice and clear coat. I once tried "Non-Metal Primer" which was meant for plastic or other materials and had nothing but bad experiences with it. To start, I cleaned the parts really well with soap and water and finally with alcohol. When plastic pieces are made, a releasing agent is used to allow them to be easily removed from the molds. You'll want to make sure you've cleaned all of it off as well as any Armour All or anything else you've put on them which will keep the primer from properly adhering to the parts. Then I sprayed a very thin coat of primer on them. I left them for 15 minutes or so and then sprayed another really thin coat of primer. You only need enough to cover the part and no more. If you can't see anymore black (or whatever colour your parts are) then you've got enough. Then, after waiting an hour or so, I did the same with the colour coat. I gave it a really thin coat and then left them for 15 - 20 mins and then gave them another coat. Again, just enough to cover the part. Depending on the colour you'll have to look closely but if you can't see anymore gray then you're done. For both steps, by the time I was done the last part the first would be ready for the next coat so there really wasn't any waiting around. I left an hour or so again between colour and clear. You don't want to get impatient or the clear can blend with the colour and it won't be the effect you want. The final step was two thin coats of clear. This gives the parts a bit of a shine and will protect the paint. Finally, I left them for over a day to dry before touching them again. This process will work for you if you want to keep the stock texture of the parts and don't want them too glossy. I wanted mine to look as though they were made of red plastic and it came out perfectly. If you want them to look glossy like the outside of the car then you can sand them before hand and use more coats of paint and clear coat. The more paint you use, the smoother and glossier it'll get. If you're not sure what you want though, try to see a couple cars in person to get an idea of how it looks. I did my last car this same way so you can see what my preference is. I find that when you use more paint and get a glossy look that they end up looking cheaper and don't fit into the interior as well. It would probably also be a lot harder to touch them up if they got scratched. Finally, don't get too wild on the painting. Look at the pics of my car and think about what's going to get touched or hit. I tried to avoid painting anything that will get easily scratched. Others just try to be careful but I find it's not worth the hassle. I wouldn't paint the door panels or the console or the back seat area.